Curran provides expert applications of high temperature baked catalyzed organic coatings specified to provide a protective barrier to corrosive chemical exposure. Curran meets rigorous client specifications and quality control parameters. Our gas fired convection oven can accommodate bake curable coatings to 750F; the oven can accommodate pipe to 45’ L, vessels to about 80” diameter. Contact Curran to discuss your service conditions and specification parameters; we have experience using thermoplastic and thermo-melt coating materials; Baked Phenolic, fluoropolymers (PFAs, PTFE, ETFE); FBE; and Polyphenylene Sulfide (PPS). Baked Phenolic – Dense, tightly adhered thin-film resins, having wide chemical resistance for chemical storage and transport applications. Shop applied and baked catalyzed on new fabrication steel substrate, qualified immersion services to 360F. 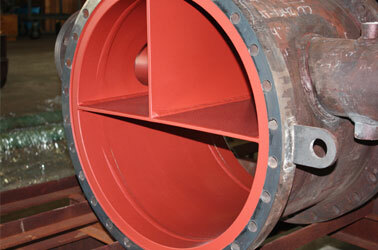 Used for ISO containers, chemical transport, pressure vessels. PTFE non-stick coatings – Low coefficient of friction, high-temperature resistance, and superior chemical resistance are the key benefits of these coatings. PTFE, PFA, FEP and ETFE fluoropolymer resins are marginally differentiated in mechanical performance but offer immersion resistance up to 500F. 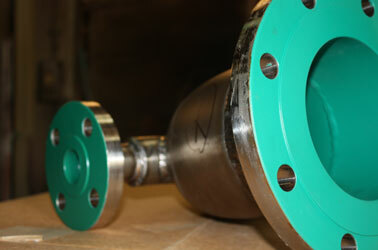 Applications for pressure vessels in corrosive services, exchanger channels, pipe ID, valve bodies. StreaMax™ – A Chemours coating, shop applied fluoropolymer; bake catalyzed, uniform adhesion; reduces surface roughness and drag, low friction coefficient. Excellent non-stick and product release, for some services up to 500F. PPS coatings – A thermo-melt coating offering excellent chemical resistance and thermal stability, permeability to many gaseous materials.Suitable for some services to 500F. Application can be pigmented with PTFE to improve release properties and achieve hydrophobic finish.Applications for small vessels, exchanger components, valves, float gauges. 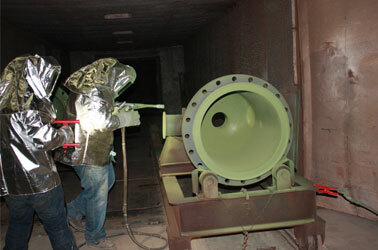 FBE coatings – Thermosetting epoxy coating designed for corrosion protection; applied as a dry powder which melts and cures to a uniform,coating thickness. Suitable for operation at moderate temperatures and pressures in the presence of H2O, CO2 and CH4, crude oil and brine.Applications for short pipe ID, pressure vessels.